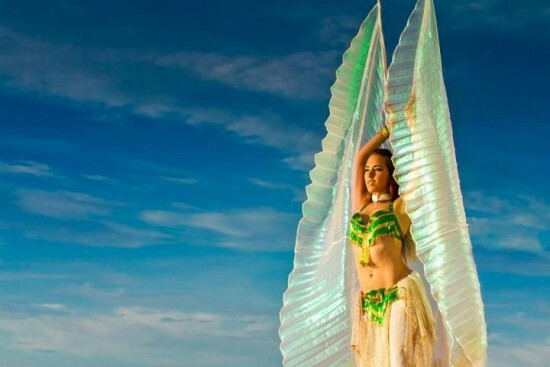 Groovolution Entertainment specializes in Fire, Aerial Arts, Belly Dance, LED/Black Light Performances, Stilt Walking, Costumed Characters, Mermaids, Greeters, Promo Models, Go-Go & stellar costume design. We offer customizable entertainment for any type of event, corporate function, or party. Our diverse performance capabilities, skill, & experience allow us to create one of a kind events. Prior clients include; The Breakers, The Harriet Himmel Theater, Eau Spa Palm Beach, Palm Beach & Ft. Lauderdale Boat Shows, LW Holiday Show, Winter Fest, Fresco, Beyonce-H&M Commercial, Schools, Atlantis Resorts, Corporate Events & exclusive parties at Private Residences in Palm Beach, Miami, Tampa. Best Fire Entertainment in the South Florida. The Cirque comes to you!!! I'm super impressed by the showmanship, technique and expertise of these seasoned performers. They belong in Cirque Du' Soleil! The combination of our stage presence, costuming, broad range of equipment, and choreographies bring you an extravagant spectacle like no other. We are happy to customize our performance to any theme and have performed for a variety of events: corporate functions, grand openings, birthdays, festivals, weddings, commercials, music videos, and much more. We offer two formats of performance; mobile and featured. If you are looking for a longer presence we would do a mobile performance. This means we would go on and off stage for the allotted amount of time, creating the atmosphere and strengthening the theme. A Featured performance is a structured show aimed at capturing all attention for short but action packed amount of time. Our fire performances are mesmerizing crowd pleasers. We train continually to use intriguing fire props to their fullest potential, as well as designing and producing some of our fire toys. 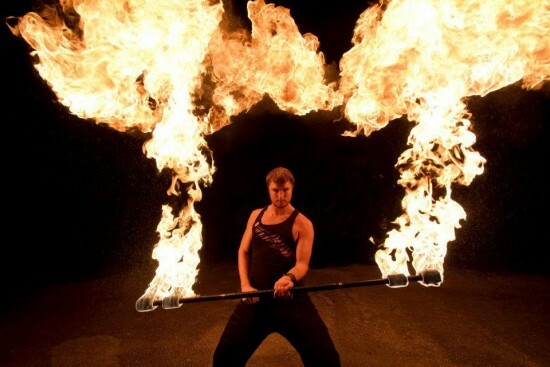 Our range of props spans from fire fans to fire hoops, palm held flames to massive 8 head dragon fire staffs, as well as from spinning fiery poi to fire eating and the always dramatic fire breathing. Nothing is more exciting than viewing a fire performance. 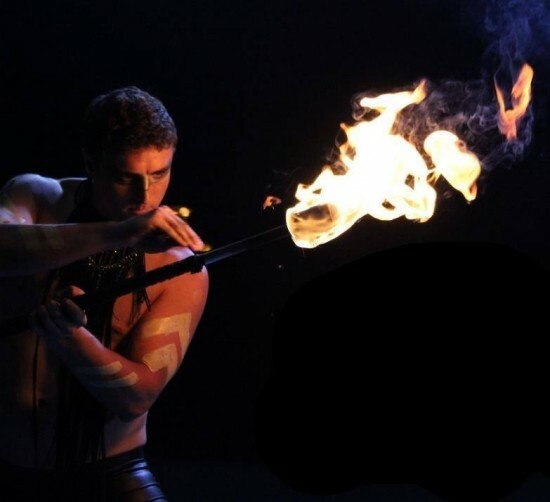 We are instructors in the Fire Arts and all our fire performers are fire safety trained. Belly dance is a beautiful technical dance form that requires years of training. You are sure to be happy with our movement vocabulary, since we have traveled for many years to study with the best. When you book Groovolution you are guaranteed a high standard of movement, technique, performance. Many of our belly dancers are members of Bal Anat. The longest running belly dance troupe in the world, running actively for 50 years. All members of Bal Anat must acquire 4 certifications prior to being allowed to audition, and then they may be accepted. Bal Anat is based in Berkeley California, and our dancers have toured the world performing with them. The depth of understanding of music and movement each of us exhibit allows us to accommodate many themes with our belly dance performances; traditional belly dance, also hip-hop, vintage, tribal, and even gothic fusion belly dance. We incorporate a variety of belly dance equipment, such as veils, veil fans, sword, zills, and isis wings, to keep the audience engaged. If you desire a bit more of a spark, we are happy to add fire to our belly dance performance. During fire-belly fusion performances we incorporate a mixture of belly dance and a selection of small props; palm torches, orb, fire eating, fire fingers, sword. Our Stilt Walkers continually enhance their level of performance. We bring fun &/or drama to Circus Parties, Grand Openings, Trade Shows, School & Church Events, Holiday Parties, Fundraisers, & Private Events. Jack Frost, Mermaids, Jellyfish, Queen Frostine, Cowboys & Cowgirls, Flamenco, Ice Maiden, four legged creatures - Unicorn & Black Cat, and so many other characters perform on Stilt, Fire on Stilts, & LED/Black Light on Stilt. Our attention to detail, crowd interaction and our incredible costumes always leave our clients supremely happy and the audience thrilled. Due to our performers’ versatility, we can provide standing characters for Photo Opportunities & Mobile Stilting for larger venues. * We can create a custom costume, for a specific theme, at an additional cost. Our combination of costuming, and choreography with black light reactive and LED props leave us shining brighter than the rest! For our black light performances we bring black lights to set up around our performance area, wear black light reactive costumes, and accessories. If you are looking for a glow show with out black lights we can provide that as well! We incorporate a large variety of equipment, even custom equipment. Some of the props we use are: Electron clouds LED hula hoops, veil fans, double staves, LED poi, vortex umbrellas, ribbons, staff, and MANY more! Many of the props used in our black light performance are similar to our fire performance. Not only do we have beautiful Mermaids to decorate or swim in your pool, silk fan dance, and fire perform, we also have a Stilt Walking Poseidon & Jellyfish, dancing Nymphs and Aerial Mermaids! We offer a variety of circus acts including aerial silks, lyra (aerial hoop), aerial net, aerial hammock, cyr wheel, acro staff and more. We offer highly skilled aerialist who have dedicated years of training to be at the top of their field. These athletes work hours a week training to provide a effortless performance, flying through the air with the greatest of ease. These acts can be done together as a featured performance or spaced out for a more ambient performance. Our Promo Models work events from convention trade shows to boat shows and from hot rod booths to the kids zone at fundraisers. Our Go-Go Dancers can keep the party going in your club or on your dance floor. Our Holiday Santa has been performing for years and has a full, real beard, as well as a theatrical level Santa costume. Our lovely Santa’s Helpers, wearing their signature red with white trimmed mini dresses, are perfect event greeters. They greet arriving guests, handing them their first glass of champagne or bid adieu to your guests as they pass out SWAG bags. They can interact with guests, inviting them to the dance floor or into Santa’s Workshop, depending on the theme of your event. Our larger than life Puppy & Penguin delight guests of all ages with their silly shenanigans and antics. Travel Expenses are calculated using the IRS standard round trip mileage rate of $0.55/mile, originating in Boynton Beach, FL. We look forward to speaking with you, to answer any questions that you may have, and to assist you in creating an event which will make memories that will last a lifetime.